Times: Daily 10:00, 12:00, 14:00, 16:00, 18:00 & 20:00. Meeting Point: Old Town. Directions and a map link will be included in your booking confirmation. 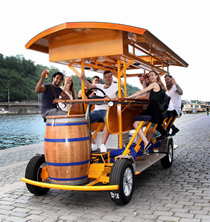 Join us aboard the Beer Bike for the ultimate fun trip through the streets of Prague. The Prague Beer Bike tour is a 2 hour ride through the heart of the city, passing through the Old Town and along the river, seeking out those stunning panoramic views, and taking in the city's major sights. All accompanied with free-flowing ice-cold drinks and your choice of music. The trip is led by an experienced driver/guide, there to ensure everything runs smoothly for you. We'll also show you the city's hotspots, and offer advice on where to eat, drink, dance and party. Think of it as the best city intro tour you've ever done! Our Beer Bikes are top quality and brand new, and the most luxurious in Prague. There are 15 seats on each bike, 10 with adjustable pedals. There's also a 4-speaker sound system, LED bar lights, and a super-silent electric support engine to make the peddling easier. Feel free to bring your own music on USB or a Bluetooth device. If not, we will take care of the tunes. Included in the price is 50 litres of premium Czech Budweiser Budvar beer (that's a lot of beer!). You can pre-order Prosecco or soft drinks instead (see Optional Extras below). -There are two Beer Bikes, so a maximum of 30 people can do the tour. -There are regular toilet breaks and photo stops whenever required. -If the weather turns bad we can cover the sunroof. If it is terrible, we can postpone the ride, based on mutual agreement. -Children are permitted, but alcohol is only for over 18s. If you don't like beer, exchange it for 10 bottles of Prosecco. If you want beer and Prosecco, add on this pack which consists of 3 bottles of Prosecco, 3 litres of cider/soft drinks, 3 litres of water. If you want your drinks served to you by a cute bartender, order one for the ride. Other optional drinks packages are available on request.